During a recent trip to Japan I was lucky enough to have the opportunity to visit the Morioka factory where mechanical Grand Seiko and Credor watches are produced. The factory also produces quartz movements for OEM sale and also precision tools. I had visited the factory around a year earlier but this time I was able to view some different parts of the facility. A report of my first visit can be found HERE. 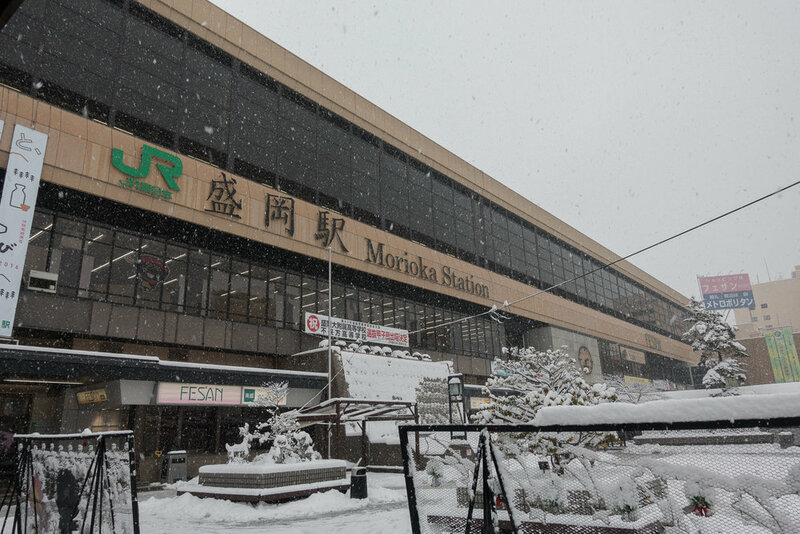 I left from Tokyo station in the morning and caught the Hayabusa shinkansen to Morioka. This trip takes a little over two hours and when I arrived at my destination it was snowing heavily. I dropped off my bags at the hotel and grabbed some lunch before catching a cab over to the factory. The cab ride is about 25 minutes and I had initially intended to catch the train and walk from the station but the heavy snow changed my plans. When I arrived at the factory I was greeted by Ms. Nanaki Saito from the General Administration Department who I had met on my previous visit. We headed inside and I met with Mr. Ryoji Takahashi the General Manager of the Shizukuishi Watch Studio. We were also joined by Mr. Kenichi Ishida who is the manager of the Mechanical Watch Engineering Section at Shizukuishi Watch Studio. Ishida-san and Saito-san conducted the tour during my previous visit and would be doing so again today. 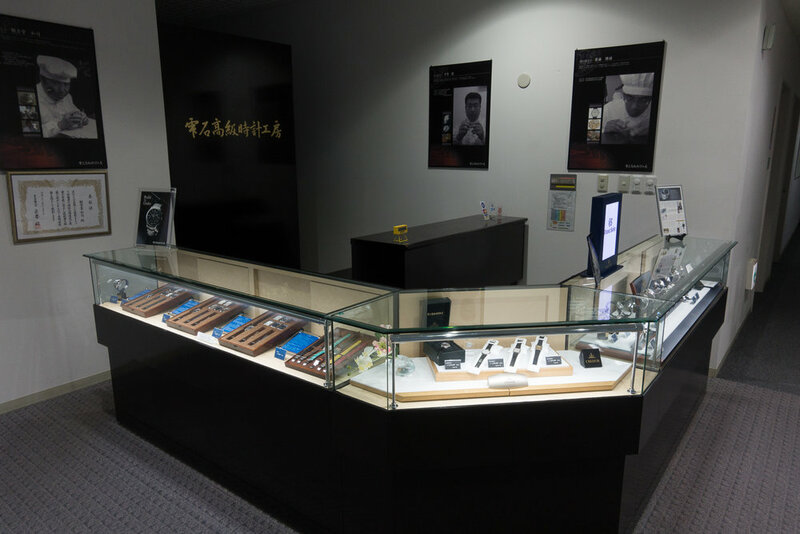 We discussed the Seiko boutique that had opened in Sydney just after my previous visit I expressed my pleasure at having this store available in my local area. It was also explained that numerous workshops were going to be off limits for the tour today due to the sensitive nature of their current operations. This was likely due to production of items for Baselworld. They also explained that during the tour most areas would not allow photographs just like my previous visit. Takahashi-san very generously offered to drop my back to my hotel after the tour but I advised him I would be able to take a cab. We then headed out to the foyer and took a group photo before Takahashi-san headed off to another meeting. We then proceeded to begin the tour. The various facility staff were wearing a couple of different color uniforms but I was advised that the colors do not have have any specific meaning. The first workshop that we visited was the tool manufacturing section. In this area they manufacture drills, cutting tools, taps, size gauges, carbide brooches and milling tools for internal use and also to sell to external companies. SII make all tools that they are unable to source from normal suppliers. As machinery tools for watch making are very specific they have had to make many items themselves. This ability to manufacture precision tools has allowed them to find a market in other industries for their precision products. One key market has been for the manufacture of stationery where the tight tolerances of the the tools are required for the production of ball point pen tips. The next area we visited was the NC (numerical control) machines. The tools that I had just seen manufactured were used in this section for the creation of Grand Seiko parts. Long strips of material was fed into the NC machines for the production of the Grand Seiko bridges. There was twenty five individual tools that were utilized in the machine to produce the single bridge plate. The bridge plate is also engraved at the same time with the number of jewels, caliber number etc. The next machine was producing the GS dial date holder that sits in the middle of the dial at the same level as the date wheel. This is not a part that will ever be seen by a customer unless their watch is being serviced and they are there to see the disassembly. On date dial plate the tool remains stationary while the plate itself is moved. Unlike the bridge plate machine this one did not use any oil as the amount of material being cut away is extremely small. By using the oil only when required helps to minimise the amount of oil used in the total production process that reduces the environmental footprint of the factory. 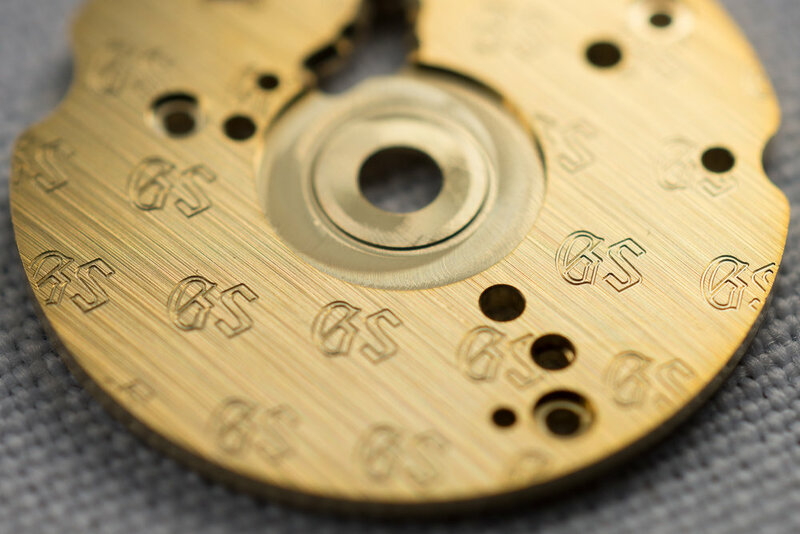 The engraving of the GS date plate takes the same amount of time as the machining process of all other components combined. Each single plate take around 30 minutes to engrave and not more than 100 pieces are able to be produced in a 24 hour period. While this plate will never be seen by the end user, and could be stamped or laser engraved much faster, it would go against the design philosophy for Grand Seiko where every part must be manufactured to the highest standards to combine for the ultimate complete package. This single component embodies the spirit of the GS design. Heading from this room we passed a group of manufacturing dies that are used for the injection moulding, punching and machining units. The design, manufacturing and maintenance of the dies are carried out in-house at the factory. This is apparently quite unusual with some manufacturers being able to produce dies in-house but it is much rarer to be able to also maintain these in-house. The production of a single die can cost 10 million yen (~US$90K) so proper maintenance is essential to maintain their lifespan. Leaving this area we next headed to see the heat treatment process. It is very unusual for a watch manufacturer to have the capability in-house as most outsource this process to specialised third parties. The machine places items to be treated onto a wave shaped plate to separate the parts and align them. This plate is then moved back and forth as it strikes a solid block at one end of its movement. This will cause the parts to slide forward on the plate when the plate rapidly stops. This is how the parts are slowly moved along the plate and through the furnace area for the hardening process. As the parts slowly move into the furnace the heat will increase slowly allowing the speed of the temperature rise to be controlled. 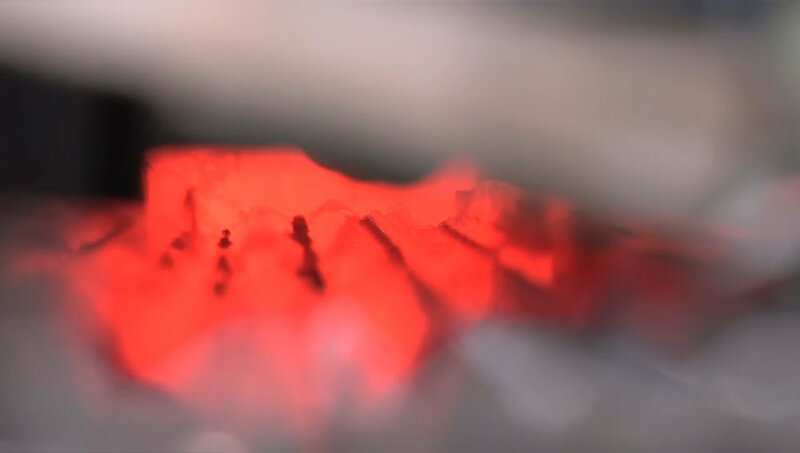 The temperature inside the furnace is over 800 degrees celsius. The parts pass through the machine and are then quenched when they fall into a basket in an oil filled bath. After the hardening and quenching process the parts are strong but quite brittle so they are moved to another machine. Here they are heated again to around 300 degrees celsius and then slowly cooled for the tempering process to make them robust and suitable for use. 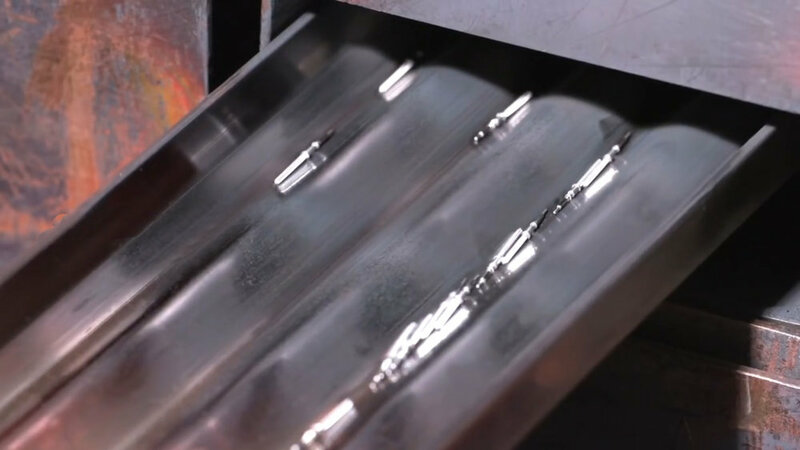 The tempering is done in an oxygen free environment to prevent oxidization. The machine creates a vacuum and then nitrogen is introduced to ensure there is no oxygen present. When I was there they were treating the stopping levers for the 6S series of movements. 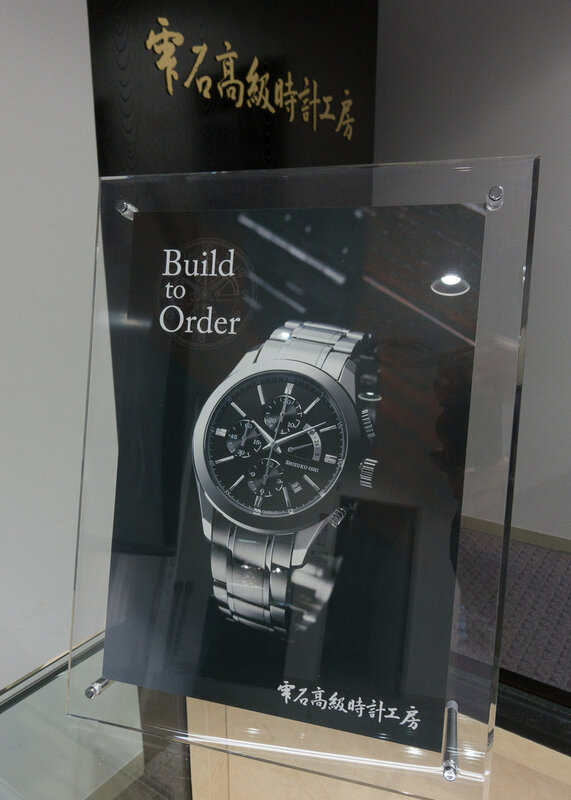 In addition to the Grand Seiko and Credor mechanical models, the factory also has a different area that is responsible for low cost OEM quartz movement production. The next workshop in the factory we visited was where the plating process for components of these quartz modules occurred. This was interesting but not related to the Grand Seiko and Credor models that the facility is famous for. We next moved to an area of the factory where in-house manufactured machines were creating components. The first machine was the NCPC5S that was producing the pinions for the 9S caliber movements. This was a cam based machine and next to it was a machine featuring a hybrid of cam and numerical control that uses servo motors and hydraulics to produce the part. These machines were producing cut gears. These parts were then shaped and finished to the tolerance of between three and seven microns. To ensure consistency random parts are pulled from the production line multiple times per day and tested to guarantee that they are within spec. After leaving this parts production area we headed to the parts finishing section. On the way there there was a monitor showing the power usage of the plant and comparing it to the previous year. This is just one of the areas where Seiko constantly aims to improve the environmental footprint of the factory. In the parts finishing area we saw the process for producing the LGS “line gradation stripes” that are on the Grand Seiko movements. The plates and rotors that are finished often have engraved text or logos on them. These areas are varnished first, then finished. When the part is then plated the plating does not adhere to the varnished finish leaving the text or logo to be easily read. The color of the varnish used depends on the model, gold is used for Grand Seiko automatics, blue for Grand Seiko manual wind and black for Credor models. Other than the straight LGS finish there is also round and a cross pattern finish that is created. 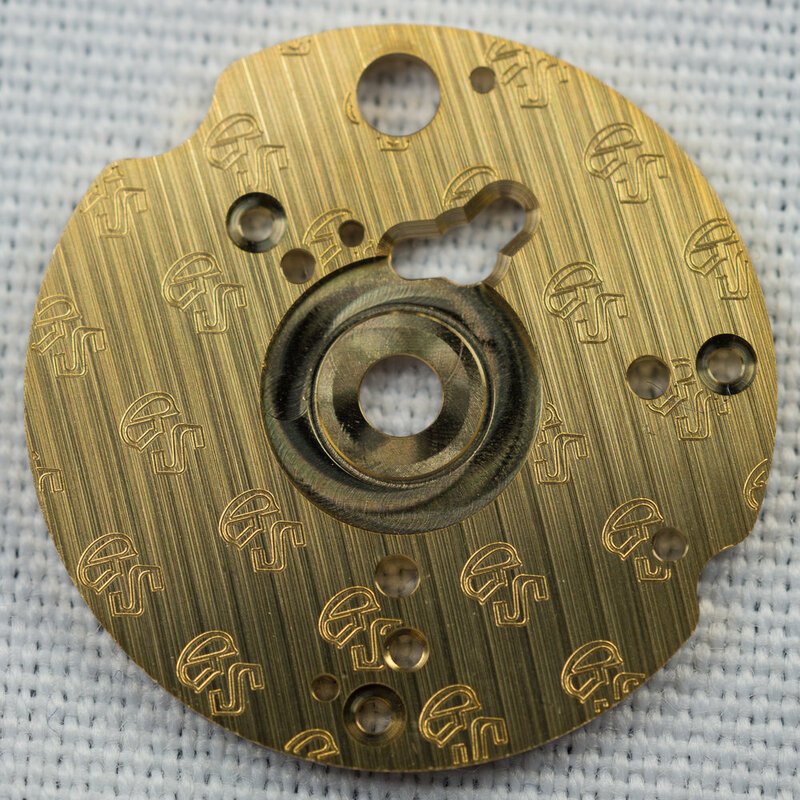 There are different machines used for each finish and the pattern type depends on the design of the movement. In addition to the patterned finishing the mirror finish chamfer on the sides of the plate is also conducted here. 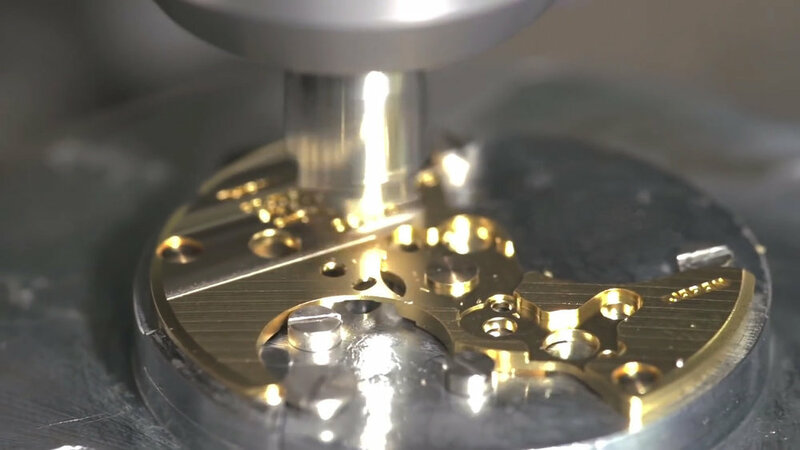 This mirror finish is carefully placed on the main plates, bridges and rotor of the Grand Seiko movements. They showed various different oscillating weights that are produced. These are comprised of a couple of different parts, the heavy weight portion is made of tungsten material, and the inner section is brass. Due to the two wildly different hardnesses of the material it is not possible to finish both pieces in the same process. First the tungsten portion is finished and due to the hardness of the material, the tool that creates the pattern only last an average of about 50 pieces. As they manufacture their own tools SII has tested a wide range of designs and materials to produce the units that are the most efficient without compromising the finishing achieved. The part is then inspected under a microscope and any debris from the finishing is removed. Once completed the tungsten component is then assembled with the brass portion and it is fixed 0.1mm lower than the brass material. This allows the brass material to be finished without engaging the tungsten section. 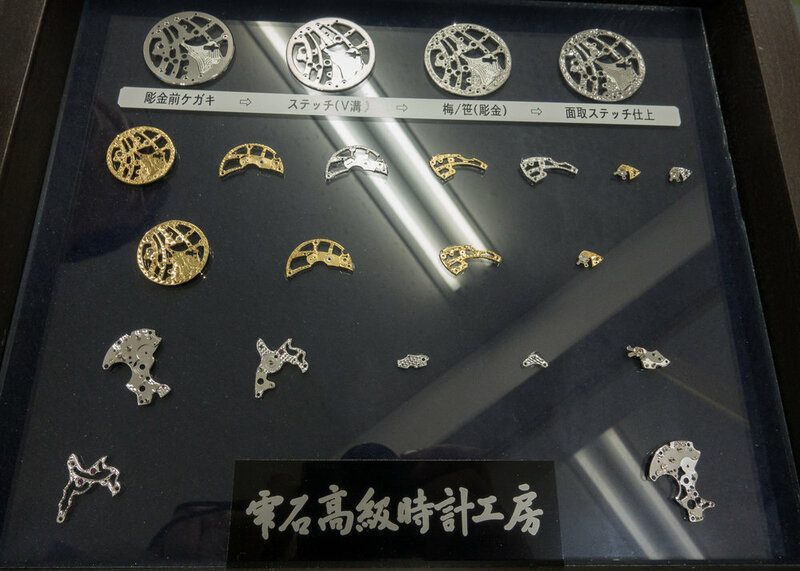 There was a couple of frames holding various examples of rotors, plates and bridges showing the different designs and logos that are produced. In this display there was a special rotor design that had an eagle or large bird on it. I did not recognize this design and when I enquired about this I was told that this was manufactured at the request of a customer for a special production order and that just the single piece was created. I was also shown the engraved movements as seen on the various Credor skeleton movements. The engraving is done in the Chiba prefecture SII office and it takes between one and two months for the movement to be fully engraved. Once engraved the movement is sent to Morioka where the jewel insertion is performed. Once the component finishing is complete they are then plated. This will produce a beautiful rainbow type of reflection in bright light that is not able to be achieved if they are not perfectly finished. 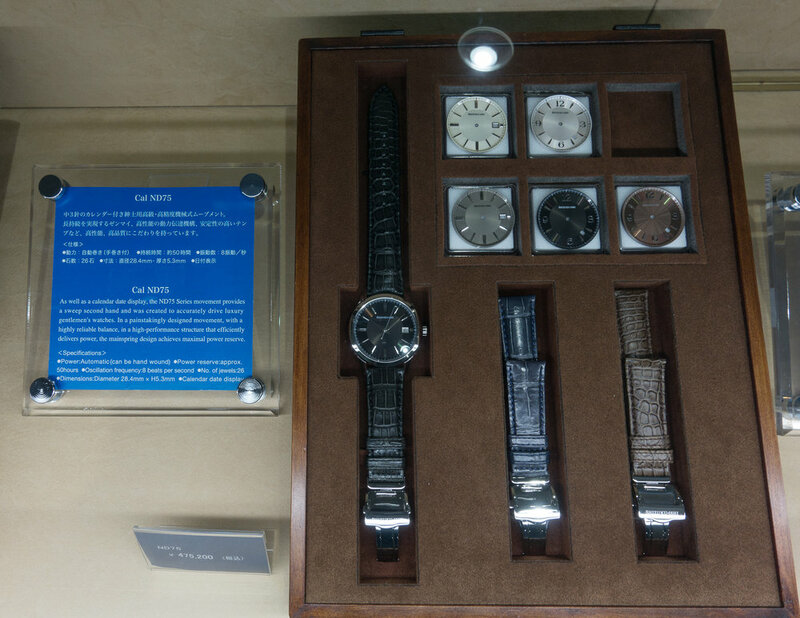 We then headed to the main assembly workshop and saw a display with the various components that make up the Grand Seiko watches. These included the hair springs, mainsprings, balance wheels, dials, cases and these were all able to be handled. The main assembly workshop had the workers at their desks putting together the components into functioning movements. On one side of the workshop was Tsutomu Ito, Meister, who is in charge of Grand Seiko assembly and on the other side was Katsuo Saito, Silver Meister, who is in charge of Credor assembly. Both of these gentlemen oversee and help to pass down their skills to the other workers in this area. The large window on the side of the workshop overlooked a wooded area of the facility and the continuing snow. We next headed back downstairs to the main reception and showroom area. 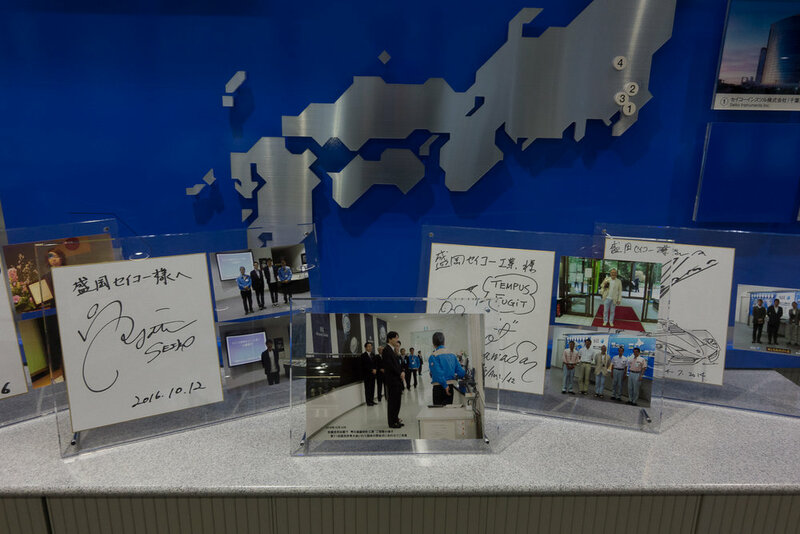 Here they had a number of photos of special guests that have toured the facility including recently the Emperor's second son and wife. 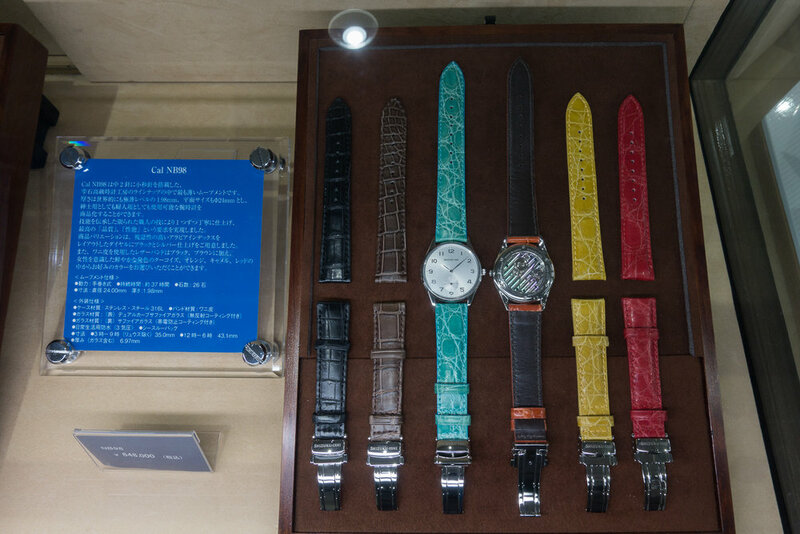 Also on display are a various watches that are able to be purchased at the factory. 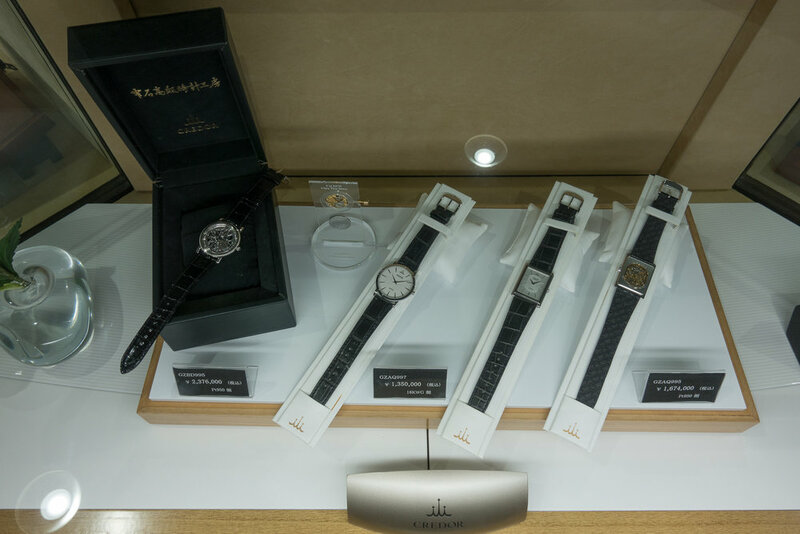 The first group is the of normal Grand Seiko models you are likely familiar with but if you purchase from the factory they are fitted with a special rotor signed by the Shizuku-ishi Watch Studio. It is also possible to have a custom built to order Shizuku-ishi watch. You can select from various calibers, dial designs and straps to match your personal taste. 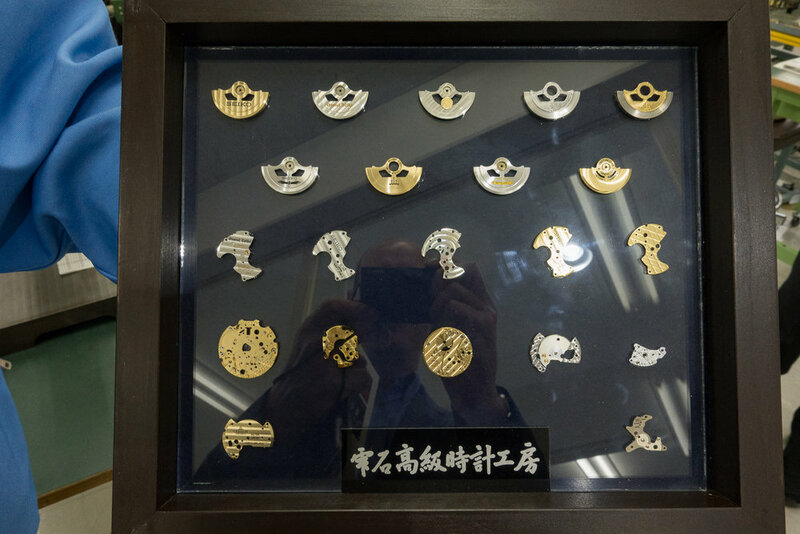 This was the conclusion of my tour but before I left I was presented with a Grand Seiko date dial holder plate that I had seen being produced at the start of the tour. As these units take over 30 minutes just to engrave the GS logos into the plate I was honoured to have been given one as a momento of my visit. 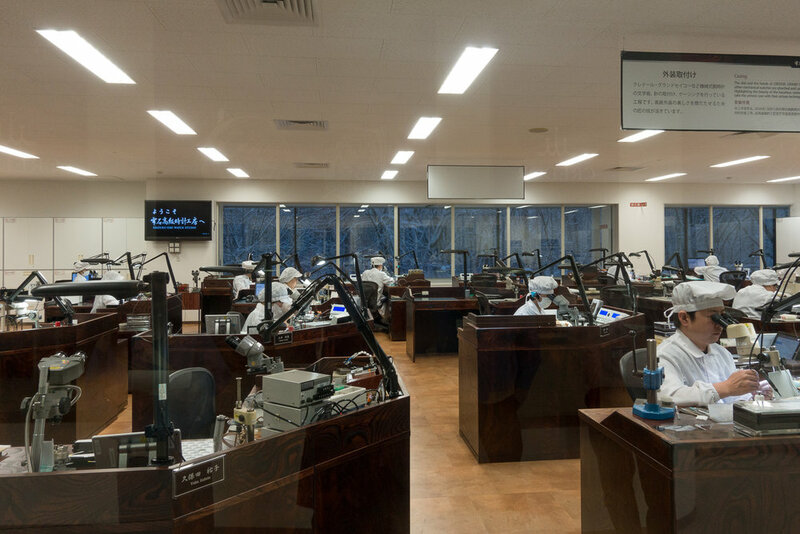 This was a great experience and it was fantastic to see the dedication and passion of the staff that produce Seiko’s Grand Seiko and Credor mechanical watches and this can be felt in the final product.